Pressure Relief Valve solutions for over pressure with or without air available. For use in liquid, air and slurry pressure relief applications. Prevents pump from over pressurizing or “dead-heading”. If a downstream line becomes plugged, pump pressures increase and the Pinch Valve Pressure Relief Valve automatically opens above a set pressure. This automatic bypass relieves the pump and line pressure and will automatically close when pressures return to normal. Prevent Tanks or Silos from rupture by installing a pressure relief valve. If tank pressures become greater than the Pinch Valve Pressure Relief Valve setpoint, the valve opens to prevent silo or tank damage. Prevent any pipeline overpressure using a pinch valve in a bypass pressure relief setup. Pinch Valves can be manually pressurized in the field where no compressed air is available. This allows Pinch Valve Pressure Relieve Valves to be placed in the field at a set relief setpoint with no compressed air requirements. Ideal for pipelines and AKO valves will hold a set pressure for months with pressures monitored remotely. When compressed air or a suitable fluid, at approx. 30 psi above line pressure, is applied to the valve body the valve will fully closed, or “pinched off”, forming a tight seal even on fibrous and or granular materials. Upon increase of (internal) system pressure the sleeve is forced open providing pressure relief. When the internal system pressure, forcing the sleeve open, returns to normal the sleeve is again forced closed by the set control pressure. Type LNV Pressure Relief Valve Setup (use when control air is not available). The valve is pressurized to the set internal pressure, then disconnected. 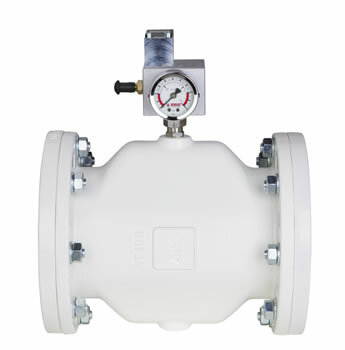 The valve holds this internal pressure for months without leakage and can be monitored using optional Low and High Pressure Switches. The LNV valves are good for oil and gas and mining applications, where the valves are set in the field away from utilities and compressed air supply.